Scientists have discovered a planet with more water than our Earth and a steamy atmosphere. It is an exoplanet, a planet outside our solar system that orbits some star other than the Sun. 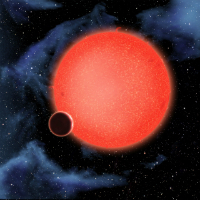 The name given to the planet is GJ 1214b, and it was discovered in 2009. The planet is larger than Earth. Its diameter is about 2.7 Earth’s diameter and weighs almost seven times as much. It is close to its star and orbits it every 38 hours. Its temperature is estimated at around 230 degrees Celsius (450 degrees F) – ooh, that’s hot! It is about 40 light years away. In space distances, that’s not too far. A light year is the distance that light travels in a year (about 6 trillion miles or 10 trillion km).